I had many plans to have plenty of time to write. I even had this afternoon off, and thought I’d get it done in leisurely fashion. Plans don’t often go the way I think they will. I took the day off to help my sister clean out her car, which got totalled. (Accident when she wasn’t even in the car.) She is currently sick, but, it had to be done soon. Also, I am listed on the title because I was the co-signer on her loan, so, I had to also sign the title over to the insurance. Our “leisurely” afternoon consisted of a visit to the clinic for blood work, going to the auto body place to clear out the 14 years of crap in her vehicle, packing that into mom’s car, going to the insurance office, taking the check to the bank, and running to get antibiotics. Then, a stop at the grocery store and preparing and eating dinner. As the silverware clattered to the empty dinner plates, I looked at the clock and it’s time to go to bed. Already. That’s when I said, ” *expletive. * It’s Thursday.” I thought about ignoring it, and I even was about to go to bed, when I managed to get myself into the chair by promising I would make it a brief post. In other news, my mom’s company went out of business, so, she who hasn’t gone back to work from her hip surgery is unemployed. The uncertainty is not my favorite bedtime cocktail, but, right now, that’s what is being served. And, I am tired. I started working on the YA time travel series this week. This doesn’t sound so very earth shattering, but, it’s probably been on my mind for more than a decade, and I decided to stop waiting for the characters to drop into life, or plot to magically plant itself in my head, no, I would actually *work* on it. Actively. I wrote a few pages, and then decided on a radical “venue” change, and re-wrote them. It has sparked a few other things into motion, and I think that maybe it’s a sign that this is what I should be working on? I don’t know. What most people don’t know is that there is actually a connection between this series and the SHUSH Museum, which probably sounds absurd, and in a way, it is. I’m not going to say more about that right now. It’s part of how I’m building them all to come together, and I mostly feel like as cool as I think it will be, the amount of work it will take to pull off will not translate into any sort of return on the investment, and no one will give a flying frack about it. There is part of me that is looking at the amount of work involved to make the whole plan I envision for this thing, and know that I have very often poured tons of effort into things that didn’t do me any good. In fact, most of the things I’ve poured tons of effort into have done me no good. And, while there is a decent chunk of my hesitation that is wrapped up in the normal fears of creative sorts that work very hard to keep us locked in our heads and not creating, there’s also the fact that none of the things I have managed to create have been particularly successful in finding an audience. It doesn’t help me fight off those fears if they’ve been RIGHT at every step. Maybe it’s just insanity to continue to pour effort into things that really ARE doomed to fail? Why do I keep doing this? Because, I will tell you, writing is hard. Marketing is harder. I don’t really like doing any of these things. This is when I’m supposed to wax poetic about the urge to create, and how that is supposed to sustain us through these periods of doubt. Except, I’m not entirely sure I am feeling that urge. I feel like I’m doing the only thing I know how to do, to keep trying to do what exactly? To somehow turn these things into a product? To actually, FINALLY make consistent money on the crap that comes out of my head? Am I completely delusional? Who would pay for these things? *I* would not pay for these things. I am not even convinced that the small audience I do have would bother to plunk their money down for products. That is, while they’re loyal and engaged and the best and I love them, would they actually feel the content was worth spending money on? Even more so, I’m not sure that the content I am planning on building for sale actually matches the audience I am building. In other words, the people who read this are the people who would be interested in what I have to sell, as it’s different from the content they know. Am I wasting my time building the “wrong” audience for the stuff I hope to sell? But, I’m trying to not think about the money part of this equation, even though, it’s taking a bigger and bigger part of my attention as I can’t seem to improve my income by the usual routes. I have tried. More than once. And after trying dozens of the usual routes multiple times? I’m feeling fairly confident in my assessment that an increase in my income is not coming from those routes. I am exhausted by the limits of thin margins. How much longer will things hold together? I don’t know. The only thing that seems to make sense is to keep going forward, even if it doesn’t really feel like a meaningful direction. So I will celebrate a few pages of a start, and hope more pages follow. The Boyne River. There’s just something about Irish rivers. I’ve had millions of thoughts running through my head this week, which is, admittedly, pretty much normal, and probably is something everyone could easily say. Usually, I have a zillion ideas and they send me in a dozens of unproductive directions. This week the thinking has been a tad more philosophical and focused, which has been somewhat confusing to me. I am not used to it. These threads are in the same flowing river, which I say not to be poetic, but to give an image to what I mean by “focused.” Most of the time, I have an idea in a lake in Maine, and a thought about the river in Egypt, and then I wonder about a pond in Germany, and a swimming pool in China. They are all bodies of water, but, they really, really, really don’t overlap. Having a flow of thoughts in a single river, however, means that the ideas are all going in the same place, and I’m intrigued by this development, and I’m also finding it unnerving, because, it seems to be heading to a place I really ought to go, but, also that I am scared of it, and there is some active part of my lizard brain that keeps pulling a curtain in front of the path when I get close to glimpsing the thought’s destination. I am clearly afraid of seeing what is behind that curtain. Several times this week I’ve had some really good thoughts in this river, and those thoughts have wanted me to sit down and write about them, to deliberately follow them to their conclusion, and I want to capture the elegant phrasing my mind churned up as I paid attention to it, and because I am in the store or not near a pen, I push it aside, and tell myself I’ll get to it shortly. I really haven’t managed to get to any of these things. I’m struggling even to recall any or all of them when I sat down to do the work. There are answers in there. I just need to have the courage to do what I know needs to be done, and I suspect, do just that will be wildly rewarding, if I get over being afraid of it all. As I have sat down to write this, knowing that I’ve had many possible things to put here this week, and that I have largely dismissed them as being not substantive enough to sustain a full-length posting, (and yes, I know that part of that dismissal is me not wanting to face that particular topic), what I am acknowledging first and foremost is that I need to be more mindful of each of these notions and when they appear in my brain, I need to stop dismissing them. I need to give them enough space to be scary, and to put other things aside to focus on just that one thing. I need to stop deciding that whatever it is that has re-emerged into my brain is there for a reason. Does that mean that I should ignore things with deadlines or actual urgency? No. But, it does mean that it’s not time for me to decide I’m too busy for that now, when I know that “busy” is an illusion and a way for me to dismiss something that might take real work. It’s a step. And it might mean that I am perhaps finally doing the hard, heavy lifting I need to do to move forward with something akin to purpose. It might be another illusion, but, it might also be a valuable clue to the next steps in the path. The last few weeks have made me really re-think the plan to increase the frequency of my postings, and I am actually starting to get a bit panicky about this rash proclamation. I had a bout of sickness two weeks ago and it really knocked me down, and then last week, there were technical issues on the site and I ended up doing some maintenance work that didn’t get resolved until Friday morning. I’m still very behind not only from the lost time, but the resultant catch-up. I’ve re-run old columns on most Sundays for many weeks, and the shame of not having written anything new makes it feel like failure. And, really, especially as I gear-up he content volume, it presages the bigger failure. It doesn’t help me that most people don’t seem to notice that they’ve read this material before. It fills me with doubts, and makes me question whether anyone is actually reading anything, or if any of this work is worth anything to anybody. Of course, I do know that when I failed to send a column a few weeks ago there were a few people who had missed it and were concerned for me, and I felt both good and bad. I felt bad for having caused concern and for failing to send something out. Technically, it’s the first week in 259 that I have failed to send send something out, but, in that 259, there are probably fewer than 100 stories, sent many times. That starts the shame spiral again, and we don’t need to tread there again. I fantasize about having stories queued up weeks in advance. I dream of being ahead by weeks, and not having to be working on an impending deadline so that I can finish — or even start working on a product to sell. This fantasy ranks up there with a clean house and more sleep. I am starting to feel like the entirety of these projects are useless and not worth the effort, and am finding it harder and harder to argue with these thoughts. I have been buoyed by the excitement from you, my loyal readers, which has keep me pressing forward, and even with these excited murmurings, I am deflated and adrift, at the same time, the looming launch of the “secret project” tells me again how far I am behind. I had plans to be halfway finished with it by this time, and I’m being overly optimistic by proclaiming it 1/4 of the way done, and looking at a list of workable items at being fewer than I need. And I know that as soon as things are underway, I will find it more difficult to keep up than ever. I guess, I needed to share with you the fears I’ve been having, and it feels a bit better to confess. It feels even better to have gotten something new posted. And the only way forward is putting one word after another. Tiny steps. Drop by drop. Trickles to streams, streams to ponds. Ponds to lakes. Lakes to oceans. Oceans don’t come without the drops. It’s Thursday, and I had many things I had prepared for this, and all of those became moot in the presence of the holiday. Or, if not “moot” exactly, rather they are things that can be said at anytime except today, where the holiday is the elephant in the room, and everyone would be very confused and puzzled about it going without mention. And, frankly, while I am grateful about many things, I would rather ignore the fact that is a holiday. The best thing about it being a holiday is that I didn’t have to go to work. The rest of it, well, it doesn’t feel much like the holidays I remember fondly from years ago. It’s so different, that it really hurts less to just think of the day as just another Thursday, and a day that I happen to have off. Right now, having addressed the elephant, I would much prefer to change the subject, and put a happy face on things, and talk about the Super Secret project that will be launching on Jan 6. It’s starting to come together, and I really hope it’s something you all will enjoy. There is tons of work still to be done, and I am worried that I’ll be overwhelmed by the increase in production demands. That’s between you and me, right? Right. Naturally, I’m also worried that it’ll fall flat, and not go anywhere, and I’ll have sunk another bunch of effort into something that is as ambiguously successful as all the other things I’ve worked on in the last few years. What all that means, I don’t know. I do know that this speculation is wandering back into less cheery thoughts, and I’m not entirely prepared to go down that road right now. Instead, I will focus on the work in front of me, and be grateful for a long weekend in which to complete more of the pieces that must be done between now and the January. Today, winter started, and that involved a long commute home in unfortunate conditions and cold, and then I got caught up in doing things for the dentist and being indignant about their intake form, which is not only full of implications that my ability to pay the bill is vastly more important to them than is my need for care, but it took much, much longer than anyone could have anticipated, even accounting for an eight full pages. This is all to say that I had many plans for this evening, and this is as far as I got. Perhaps there will be a bonus post tomorrow. You are probably surprised (and, I hope, delighted) to see a message from me on a Thursday. I myself am surprised to be finally, actually, posting it. It means, quite frankly, that I have summoned my courage and taken a giant leap to a brave new world, and instead of feeling brave, I am terrified. With this missive, I am publicly announcing, and therefore committing to, a second weekly posting. This posting will NOT be mailed to to you, it will be a different sort of communication from what you receive on Sundays. I realize it’s on the loony side of things, but, you should be used to that from me. I am excited to announce that, starting in January, I will be revealing a THIRD weekly posting, the content of which promises to be a unique surprise. This content will be released every Saturday. If you want to get that content sent to you every week, you can add your name by subscribing here. When you sign up to get that new weekly content, you’ll get a teaser of what lies ahead. Thank you for reading this and all the other assorted things that find their way to your e-mail from this somewhat humble source. I am grateful for each of you. I procrastinated quite a bit on this post, as you probably could tell. Part of that was I had this huge black hole of sadness that the adventure was ending, and if I didn’t finish writing it, well, it wasn’t really over, right? Except, that there are bits of the adventure that happened on this day that I had really wanted to document and share, and told myself I had more important things to do, and that I needed to review my trip journal and gather my thoughts more completely before I set out to write this. Instead, I have found myself with a limited number of things I *could* work on, and this was one that fit the parameters. In addition, this was somewhat fresh in my memory, prompted by a presentation I made this week for the Adams County Genealogy Society, on doing Family History Research in Ireland, and so, I was wandering down old research paths, making new discoveries, and revisiting pictures and such as that. The morning was a bit brisk, and windy, and we had lots of luggage, so we opted for getting a cab to the train station, even though it isn’t a long walk. The cabby took the long way, which irked me a bit, because he clearly did it to pad what was going to already be a small fare, and he didn’t do it to put us on the right side of the street, just parked in a not parking spot, and let us out in the middle of the road to cross through traffic. The total was like £2.70, and I grudgingly gave him three pounds, mostly because I didn’t want to deal with change and his obvious petulance. I’m sure he thought we didn’t know any better, which is also irksome. We got on the train, and they had brought in a special train because of some unspecified difficulties, which led to a hilarious (well, it’s hilarious looking back, I guess, but, in the moment it was incredibly awkward, and a bit mortifying) comedy routine. My sister and I were exchanging notes, and dad was reading them out loud. Really loud. And repeating things (so that not only was the awkward content said just once, no, multiple times). The reason we were writing them as notes was because we didn’t want to be overheard. Which we noted on the paper, and which he also read OUT LOUD). The notes were about the confusion we were having with some of the signage, and the definite improvement of this train over the previous train, we were concerned that we had stepped into a first class compartment, when our tickets didn’t have any class demarcation. It turned out all was fine, and we needn’t have worried about it, but, we didn’t avoid the loud, ignorant American stereotype. Oh well. We carried our luggage across the Liffey along the O’Connell Bridge, and it was sad to be looking at leaving the city. I was flooded with small regrets of things we didn’t do, and now couldn’t do for lack of time. I think the others were feeling it, a bit, too, because there was this strange mad dash to the shops selling tourist stuff, to desperately grab onto a tangible memento of everything. We had largely been frugal in our spending, and had held off buying much of anything. In my case, I was worried that I needed to hold some money back for that really special thing that I never actually found, and faced with leaving the place with little to show for it except memories, things I had rejected were looking much much better now. Still, I knew I didn’t really want tourist junk, I wanted something more meaningful, and thought, maybe I would find it in Limerick, where we would have a bit more time. In the evening. As we waited for our return bus to Limerick, (right across the street from Trinity, you might recall) a group of students, with African accents, came parading off campus to bring attention to the abduction just a few weeks prior of the 264 school girls by Boko Haram. They were chanting “Bring Back Our Girls,” and I felt like I was seeing the real impact of this story, and it was powerful to see the students, mostly women themselves, making their statement. We got the bus, and were quickly headed to another series of endings. Last stop at the Tourist center. Last walk along O’Connell Street. Last time passing the Richard Harris sculpture and get a picture. Last chance to stop at the sweet shop across the street from our hotel. I did stop at the sweet shop. I had the great plan to bring back sweets for my co-workers, and I got several hundred kilos of sweets. We had dinner at the hotel, but I think it was Papa Johns take-away pizza from down the street. We checked in with our ride for the morning, and found out it was going to be before the hotel would have the breakfast out, and we asked them if there were a way to get a bag of pastries or something for us have for the road or an extra early room service, and they very graciously offered to have something set up for us early. Up early, we expected maybe a small tray of breads, and maybe some cheese, but, we got hot tea, and pretty much the normal breakfast. It was really lovely. Our ride came a bit earlier than expected, and we bolted the last bits of bread and swallowed our tea, and got our ride to Shannon, for the plane. Our great adventure had come to an end. Tuesday, our last day in Belfast, was set-aside for more research. Having located the city library on Sunday, we now set out to see what we could find. What we found was the most helpful librarian we encountered on our trip. When we got to the research floor, I launched into me spiel for what seemed like the umpteenth time. She looked at me like I was a bit of a lunatic. My sister thinks I did sound like a lunatic. I remain unconvinced about my own lunacy, but, will allow speculation upon my sanity, because, I frequently question it myself. The front door of the PRONI. For those that are sniggering, there was no Pron, so stop it. going to find what we were looking for at this library. We needed to go to the Public Records Office of Northern Ireland (PRONI). 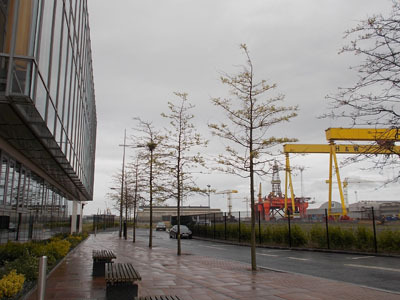 This office was located in, you guessed it, the Titanic Quarter. We set out, grateful that we now knew the way that was not the long way, and we were soon at the office which hovered feet from those Harland and Wolf cranes. Like the Dublin city Library, we got access cards, and in this case, with our photos on them. For FREE. Our cards unlocked the research rooms, and provided an ID for accessing their online databases, and with these cards, we can access those same databases from home. Here’s where you can imagine another library montage that looks way more interesting than it actually is. We looked through microfiche, and we looked through indices, and figured out how things were organized. Dad doozed a bit, and after we woke him (he was snoring) he took out the notebook I’d given him, and he started to work on the our very curious project, which I’ve not yet mentioned, and will explain later. The PRONI is the building on the left edge of the picture. The cranes, are well, right there. In the end, we did find some really interesting documents, which may, or may not have anything to do with anything, but, were worth getting photocopies of. After many hours, we finally gave up for the day. On the way back, we stopped at the movie theater by the Belfast Ice Arena (they have a hockey team), and it was practically deserted, and the list of movie options we were interested in each required an hour of waiting, and so we gave up and headed back toward the hotel. In honor of our last night in Belfast, we decided to go eat in the hotel’s restaurant, where we had pretty much, the best meal of the trip. Three courses. I had a roast pork dish, and a sticky toffee pudding for dessert. The following day, we’d make our way back to Dublin, and to Limerick. From Limerick, and, after a last night at Limerick, we were heading home. That’s a downer, I know. Sorry. In Belfast, the city decided to celebrate the holiday by having a marathon. Frankly, I’m against the idea that running for 3 times an already insane number of miles. This is not a way to celebrate anything. We were not in the marathon. 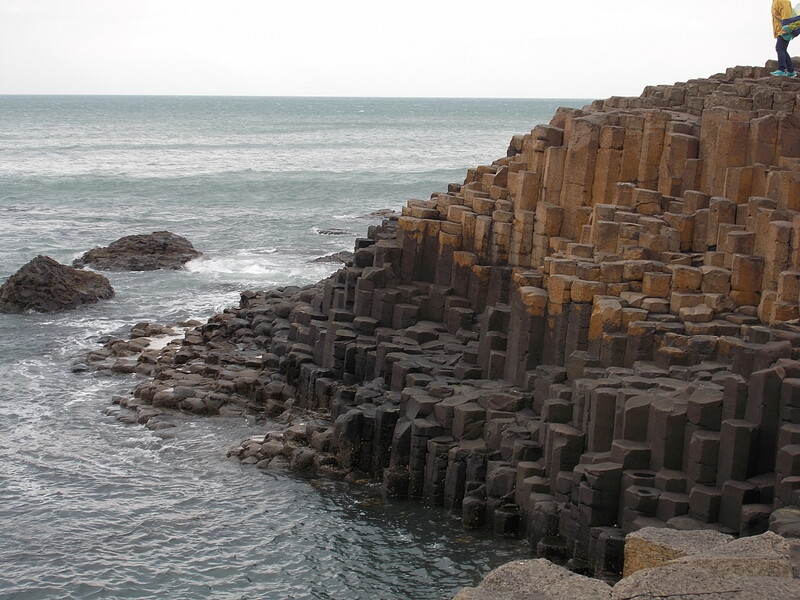 Instead, we were all gathering in front of the Europa, once again, to meet a travel coach that would take us along the coast to the Giant’s Causeway. The bus left relatively early for us-non-runner-types, as we ate breakfast, we could see the runners reporting to the start, at Belfast City Hall, just a block from where we watched, comfortably drinking hot tea and toast and sausages and all the proper ingredients of the famous Ulster Fry. Admittedly, after however many days of Irish breakfast, there were several items I had grown weary of. The tea and the toast were not among them. 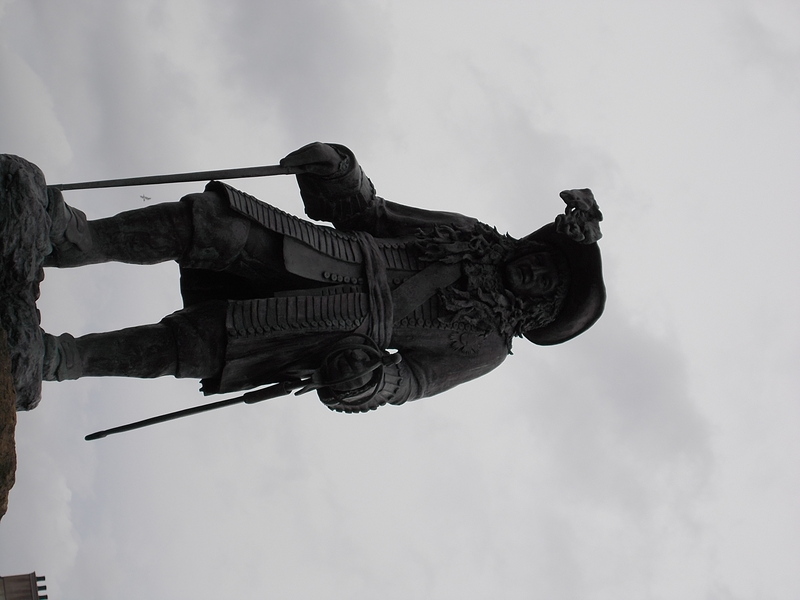 King William III. He was not a tall man, which is not entirely obvious from this picture. The bus took us first to Carrickfergus castle, which is a Norman stronghold, (yes, King John had a hand in this one, too.) and the port where William III (yes, King Billy again) came to shore. He siege-d the place, they surrendered. Anyway, they now have a statue of him by the castle. 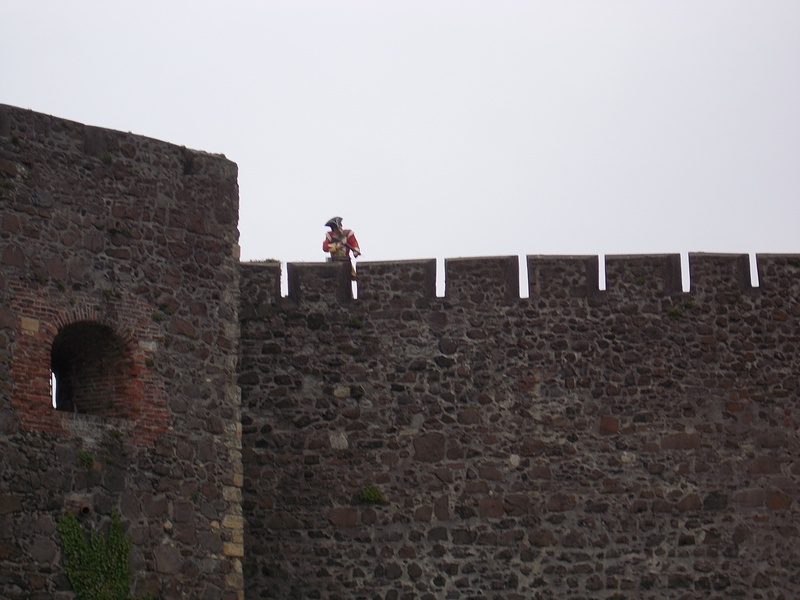 Carrickfergus castle. This red coat is keeping his weapon pointed at us, just in case we try anything. This was another castle we just stopped at for pictures. Which is probably more than fine, given how long it to to tour the last Norman castle. From here, we head along the Antrim coast, with the tour guide pointing through the rain at some of the Game of Thrones filming locations. No, I didn’t get any pictures of them, as we didn’t stop, and I was not really in the right spot on the bus. Yes, they were amazing. The site is managed by the National Trust, and you can give them £5 to cross the bridge. We opted to watch and take pictures, and we didn’t pay the fee. It just seemed a pointless, touristy exercise. We did, however, appreciate the views. 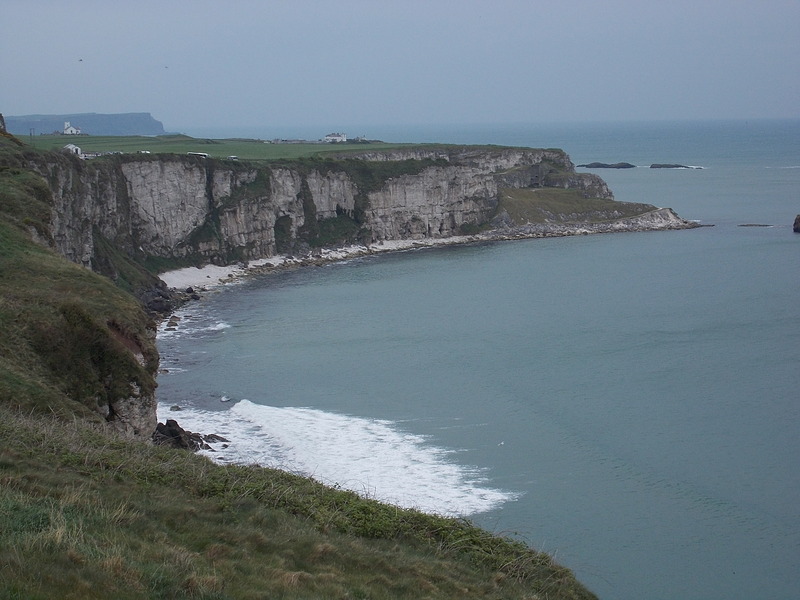 You can see Rathlin Island and Scotland from this part of the coast, and the scenery of the coastline is remarkable. I know this, because I just remarked upon it. 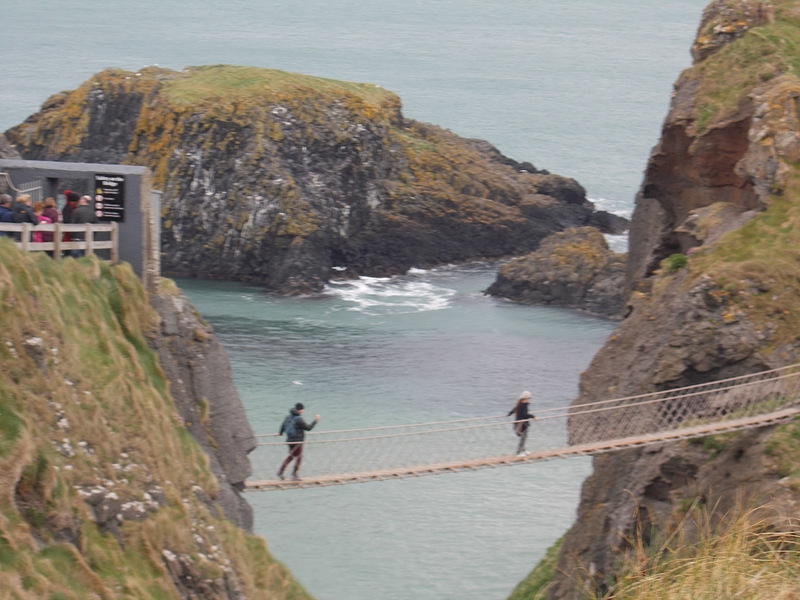 Carrick-a-Rede Rope Bridge. No, no one has ever died on it. Except maybe one of the extras on Game of Thrones in a scene left on the cutting room floor. It’s a decent hike to the bridge from the parking lot, and we didn’t really linger, because our next stop was Old Bushmills Distillery, which was the place we were going to eat lunch. I was really excited about lunch at this point. Yum, lunch! Most of our pictures of this bit of coast line, we took on the way back to the parking lot from the bridge. More of the Antrim coast, as viewed on the way back to the parking lot, from about the point where the bridge is. When we got back to the parking lot, I listened to one of the park’s employees talk about the wind and its effect on the bridge, and he was saying that this bridge is much more sturdy than previous incarnations (and I’ve seen the pictures of previous versions, and he’s not wrong about that.). He also mentioned that it’s not nearly as interesting or challenging a thing to cross anymore, the new bridge was one that is less likely to have people who get on it and freak out and can’t go forward nor back. Sometimes, these people have had to be rescued by boat. We headed to the famous distillery, and their cafe. It was pretty packed, but, they get people through the line in a pretty efficient fashion. I had a really fantastic beef stew. It was, in all honesty, one of the best meals we had. 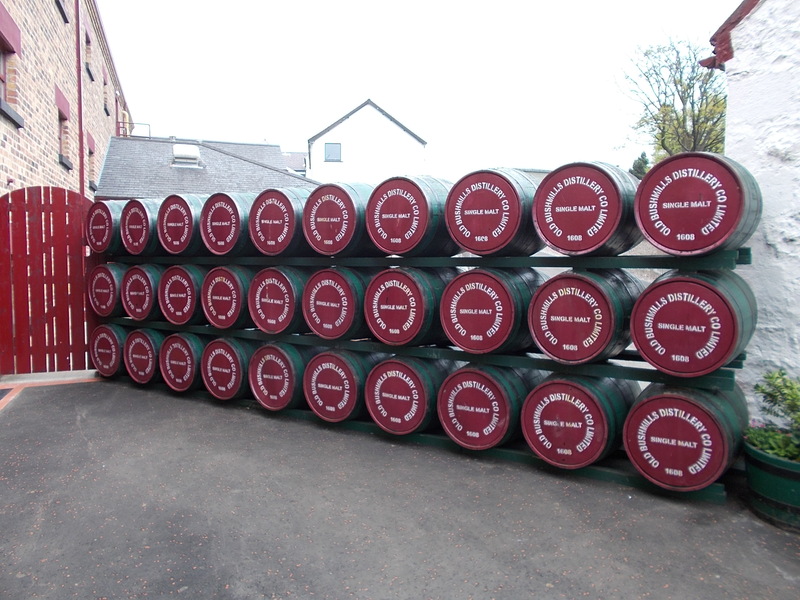 We didn’t do much in the way of seeing the distillery, which is mostly fine, but, we did see these not actually actively making whiskey barrels and the grounds and I took a few pictures. That do be where the whiskey lived when it was being turned into whiskey. After lunch, it was time to face the wind. We went to the Giant’s Causeway. The audio tour on the way to see the geological wonder that is the causeway mention this specific bend in the road as the windiest spot in Ireland. Having now been to many windy spots on the island, I can say this was, by far, the windiest spot I had encountered. And, I’ll even go so far as to say that it’s the windiest place I have ever been in my life. A Japanese man took off a relatively heavy pair of prescription sunglasses, and they blew away, and the man and the lady (I would guess at her being his wife) gestured wildly toward me and talked to me in excited Japanese which I confidently interpreted from the “international language” method. I was the closest person to them to retrieve them, and I only just manage to get them before they blew further down the road. I am known for exaggeration at times, but, this is one one of them. Anyway, they were very grateful to have the glasses back. It was somewhat crowded, and I can only imagine what the place is like in the full tourist season. Dad had absolutely no interest in walking among the structures, given that there were wet spots (it being a coast and all) and the wind, well, the combination is certainly hazardous. The combo was definitely a risk, and I’m going to admit there were a few close calls for me. We took many pictures, and we wandered around, even sat on the rocks for a bit, which is much easier than walking around on that windy damp rock. My sister managed to get a few shots without people in them. This was harder than you might guess. See person who wandered in at the last second. Off with his/her head. And the shoulders. take those, too. Eventually, we did head back. My sister and I wanted to take the tram. Dad thought spending £1 on a ride back up the hill was a rip-off, and sheer laziness. My sister and I lost. We must fight the wind. Up the hill. It was strong enough to support our weight, if we had the guts to try it. We didn’t, but, I’m certain it would’ve held us upright. It was a long, hard walk up the hill, and all I wanted was something to drink at the top of it. So, I got a drink, and sat in their cafe. We left then, and headed back down the coast, towards Belfast. Another full day come and gone. Tomorrow, we were back on the research road.